You and your little girl will live happily ever after in a world of imagination when you dress up as your favorite Disney Princess. From the classics like Cinderella, Ariel, and Jasmine to modern-day royalty like Merida from Brave or Rapunzel from Tangled, find a costume that is unbelievably picture-perfect. For authentic Disney Princess costumes for kids, explore the enchanting gowns and accessories at the Disney Store. Their website is incredibly user-friendly and features an entire section on Disney Princesses. If she is already keen on a certain leading lady, head to the 'Pick Your Favorite Princess' drop-down menu, and select the princess of her choice. Rest assured, the high-quality costumes come decked out in glitter, fit perfectly to the size ordered, arrive on time, and leave the customer completely satisfied. They come bedazzled in adornments from head-to-toe, and are almost a replica from the beloved Disney movie. Tinker Bell Costume Collection for Baby: If you want all the attention on your adorable tinker bell, choose this cute costume made to look like Tinker Bell. This pick costs around $35 and includes an easy open bottom with a layered skirt, and stretchy bodice, all decked out in green and shimmery detailing. Rapunzel Costume for Baby: Transform your little one into Rapunzel by dressing her up in this purple dress featuring lots of tulle and intricate details. Best yet, you can get it for just under $35. You and your little girl can dress the part by checking out delightful Disney Princess costumes at Party City. This retailer offers at least three variations of officially licensed Disney Princess costumes in an assortment of sizes, from toddlers up to women. This easy-to-browse site has a whole section of the royal party and a Disney Princess Party Guide, which gives you tips on how to plan a magical party along with dress-up ideas and ways to accessorize to perfection. Party City customers value the ease of search, satisfaction with checkout, variety of shipping options, and product selection. With elegant evening gowns, dazzling jumpsuits, and a multitude of tiaras, you are sure to get the fairytale you hoped for. 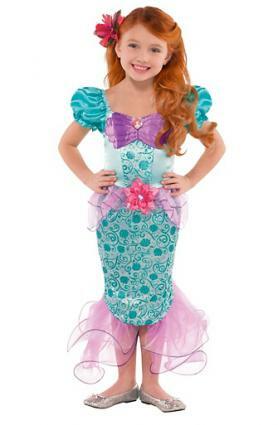 Ariel Costume for Girls: This endearing mermaid costume will surely give off that under-the-sea vibe and costs about $30. It is festooned in a sparkly, teal and purple iridescent tulle with puffed sleeves, and teal and purple mesh. There is no way she won't feel like a true princess. Cinderella Costume for Girls: Get ready for the royal ball by dressing up as this beautiful, blonde princess, all for under $50. Featuring a shiny, blue gown with a peplum mesh waist, a matching headband, comfortable glovelettes, and her signature black choker, you will look effortlessly charming. Whether you are preparing for a theme party, school play, Halloween, or just for fun, Costume Express has an array of affordable, officially-licensed Disney Princess costumes. This family-friendly retailer offers costumes for kids, teens, and women, has next-day delivery and a huge selection. Reviewers of Costume Express praise the design of site, on-time delivery, and product selection and availability. Pocahontas Costume for Women: Be cute and courageous in this costume which includes a fringed, faux-suede dress featuring a blue ribbon trim, a tie belt with teal, sparkly leaf ends, and a matching headpiece, all for about $53. Find fitting apparel for the whole regal family, and get ready to celebrate, Disney Princess style. With many options to choose from, you can narrow your search results by choosing size, price, and category. To make it ultra-simple, you can even shop by your favorite character and sort by popularity, price, or name. They also offer great discounts like 15 percent off your entire order when you like them on Facebook, free shipping on orders of $75 or more, or $10 off orders of $80 or more. A few extremely pleased customers noted Buycostumes.com's huge product selection, super quick shipping, and excellent customer service. Belle Costume for Women: You will be the talk of the town when you step out in this glamorous, golden, glittering gown for around $250. The remarkable satin material is accompanied by Venice lace applique, an embroidered trim, glitter tulle pieces with pink floral accents, and a removable back bow. Your costume will be complete with the included matching headpiece and hoop skirt, made especially for princesses. Turn fantasy into reality by selecting the most beloved Disney Princess costume possible. If you're looking to dress up as the hopeful heroine who is most definitely the fairest of them all, you are in luck. Take your pick and gracefully step into your bedazzled gown, throw on your sparkling accessories, and don't forget the tiara. You are bound to create a costume that is beyond your wildest dreams.